Written by Isabella Anderson I have enjoyed such a great vacation package in Costa Rica. I`ve traveled to the North area, had a Costa Rica Arenal volcano tour, did canopy, and I went to the beach and to a beautiful cloud forest. It’s unimaginable, a small country with so many amazing places to visit and so life. If you are curious about what to do in Costa Rica, just follow my journey. It’s full of fun adventures of this Costa Rica eco tour. My first day was in the ideally located Best Western Irazu hotel just 10 minutes from San Jose’s International Airport and five minutes from downtown. The hotel has standard and premium rooms, all of them include, air conditioning, cable TV, telephone, coffee maker, safe deposit box, among other amenities. Breakfast is included in Denny’s. Once there I made a fun Rafting tour. Rowed down the Pacuare river and experienced a trip of pure magic, exuberant wildlife and exhilarating rapids. Along the course I was able to observe the dense vegetation and the faunacharacteristic of the region such as monkeys, sloths, and a great variety of birds. This Class IV rapids includes breakfast and lunch. How idyllic is Arenal! Luckily I had the opportunity to visit Arenal and made two excellent tours. The Arenal Volcano- Tabacón tour, which is relaxing, and wonderful. I saw from up close the activities of the great colossus, its constant emissions of gases, vapors of water and explosions of fireworks. After this experience I followed it with a fabulous and healthful bath in the hot springs. The other Mountain Bike tour was also unforgettable this is definitely for adventurous people who wish to explore a part of the rain forest, the Arenal volcano and lake, this ride offers an excellent scenery. This takes approximately four hours. Includes transportation, assisting vehicle, bicycles, snacks, drinks, water and cookies. I can forget the hotel as well, I stayed at Arenal Springs Resort located at only 2 and-a-half hours from San José, the Arenal Springs Hotel offers the perfect combination between relaxation, comfort, and exuberant tropical scenery, as well as the best view of the Arenal Volcano from any vantage point in the premises. The restaurant of this hotel offers an exquisite variety of national and International dishes in a completely natural ambiance and welcoming atmosphere. While at the restaurant, I enjoyed a magnificent view of the Arenal Volcano. 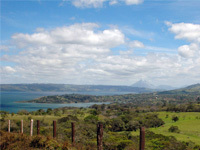 Arenal is in order words a place like heaven, the weather was perfect, the people so warm and the landscapes impressive.